Escapement aperture and the dial signature. PHOTO BY BILL TAYLOR ASC. 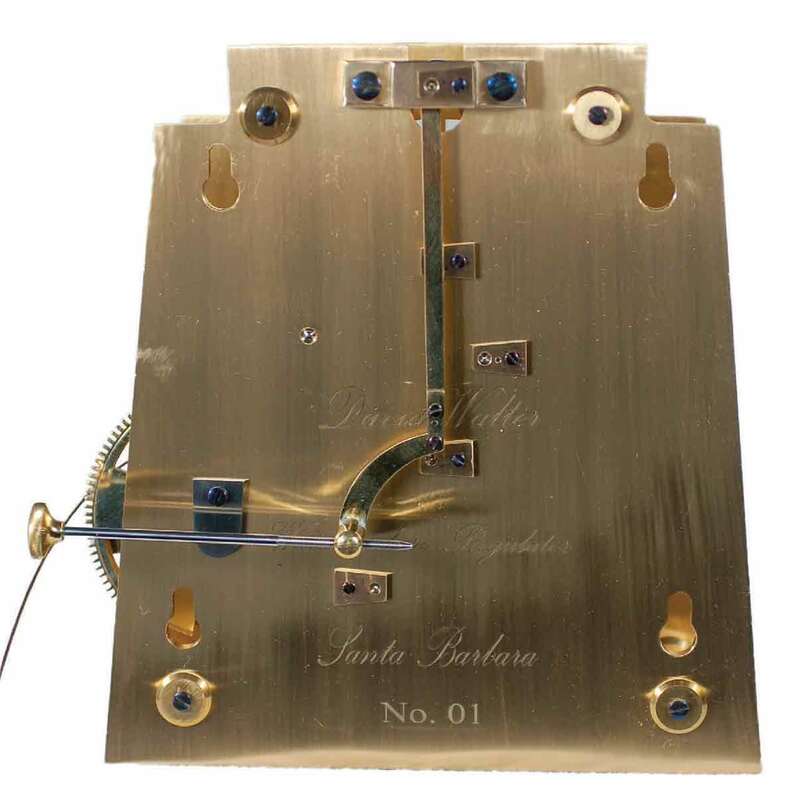 This Watchmaker’s Regulator was commissioned by Tim Jackson, owner of the Independent In Time watch store, Solana Beach, CA, to become the store standard timekeeper for setting his and his clients’ watches to time. This clock (Figure 1) is a modern interpretation of the traditional regulator. The goal is to have a contemporary designed, high-precision timekeeper made with traditional craftsmanship methods and using modern thermally stable materials. With this goal in mind the regulator is weight driven, month going, and has 25 jewels. The steel pallets nibs are cut, and red sapphire jewels have been inserted into the slots; all possible train pivots are jeweled and have numbered jeweled endpieces, and even the pulley pivots are jeweled to allow even transmission of energy to the clock train (Figure 2). The escapement (Figure 3) is a deadbeat, the asymmetric crutch assembly is screwed to the pallet arbor, and the beat adjusting screw has a ball-shaped, hardened steel tip acting against the pendulum rod (Figure 4). Figure 1. The Watchmaker’s Regulator. Photo by Bill Taylor ASC. Figure 2. Rubies fitted to the steel pallet frame. Photo by David Walter FBHI. Figure 3. 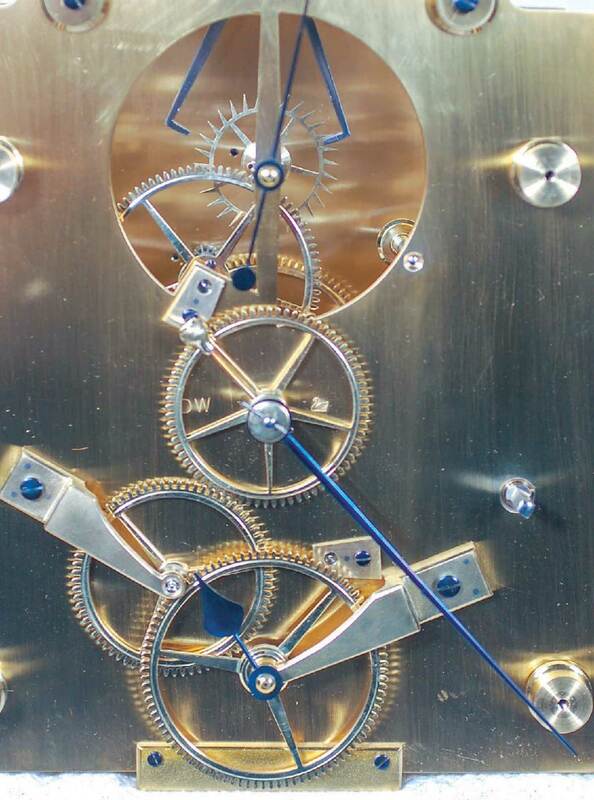 Detail of the visible deadbeat escapement. Photo by Bill Taylor ASC. 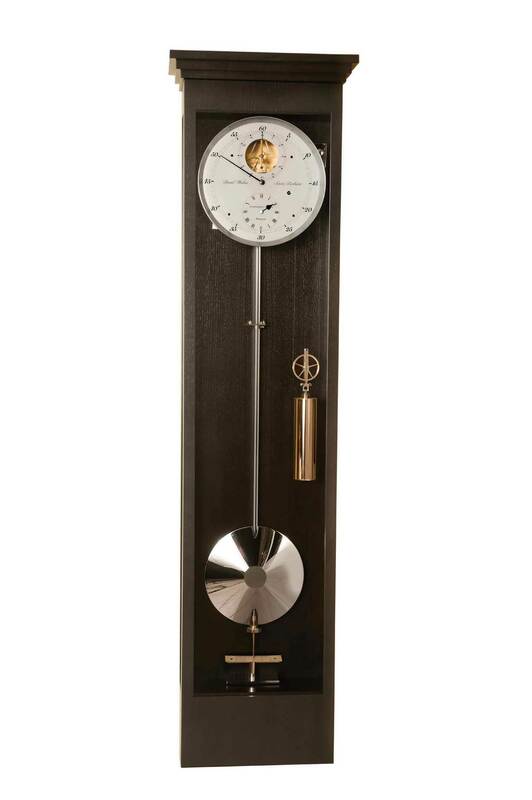 The most important item in a precision clock is the pendulum (Figure 5). 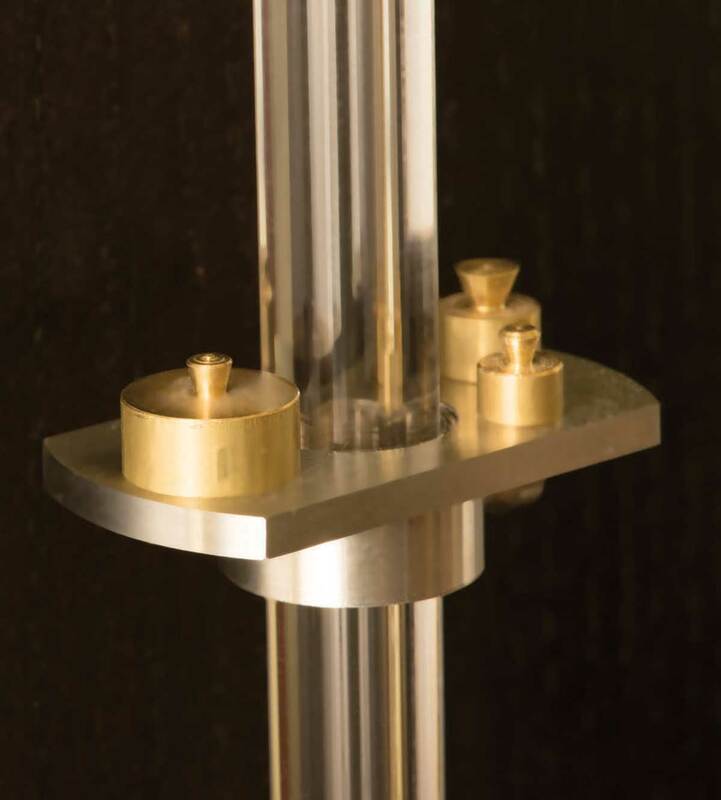 I have made the pendulum using the most temperature stable materials available; the pendulum rod is fused silica. All the pendulum fittings comprising the threaded regulating screw, regulating nut, beat pointer, weight tray (Figure 6) and screw, suspension hook, and the upper suspension clamp are made from Invar 36. The tube extending into the center of the bob is fused silica with a brass compensating spacer fitted between the Invar regulating nut and the fused silica extension tube. 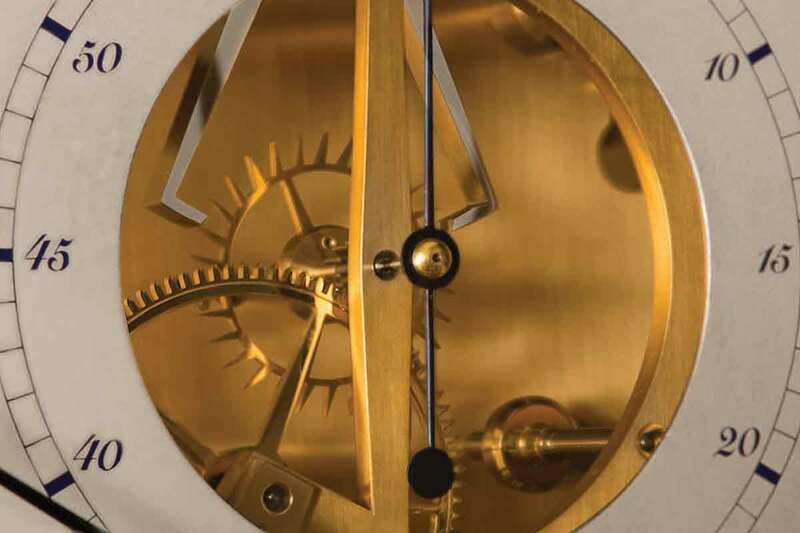 The engraved brass dial (Figures 7 and 8) is 240 mm (9.5 in) in diameter; the center of the seconds dial has been skeletonized, allowing the motion of the escapement and pallets to be clearly visible. 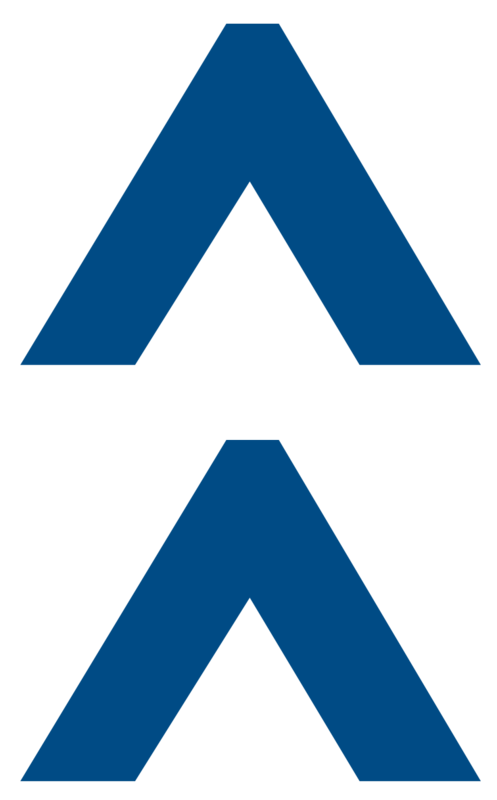 The numerals and signature are dark blue rather than the common black. The final finish to the dial is a little-known form of silvering known as French Silvering, which has a spectacular mottled look and is very white, providing a strong contrast to the blue steel hands, thus making reading the time an easy task. The flame blued steel hands are in the Walter style, both the seconds and minute hands are carefully counterbalanced (Figure 9). Figure 4. Asymmetric crutch and adjusting screw. Photo by David Walter FBHI. Figure 5. The rhodium plated pendulum bob and beat plate. Photo by Bill Taylor ASC. Figure 6. The Invar 36 weight tray for fine regulation. Photo by Bill Taylor ASC. 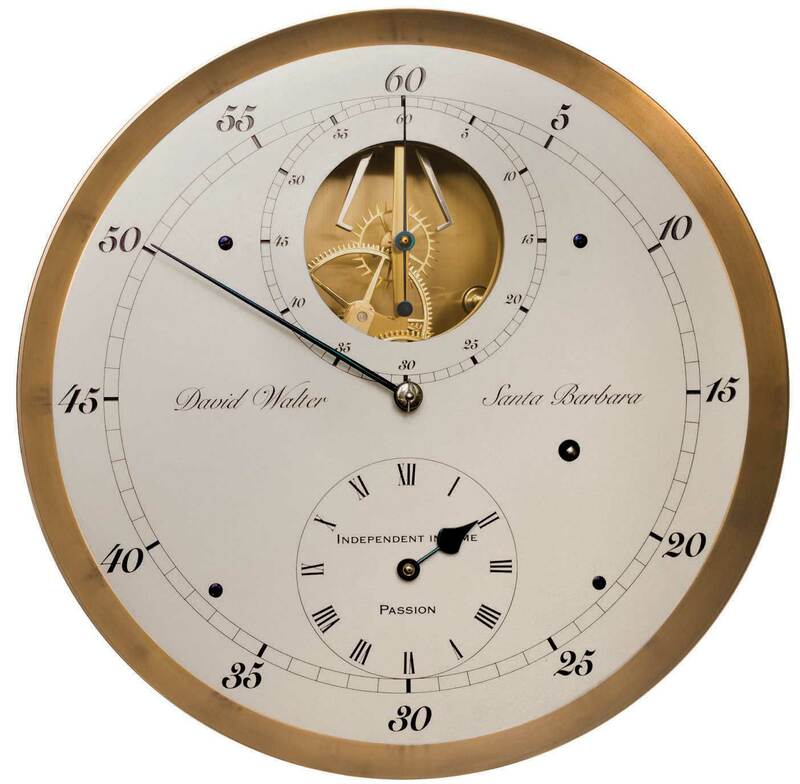 The Walter pendulum bob is solid brass 228.6 mm (9 in) in diameter; the profile has been carefully designed and machined to optimize the bob passing through air inside the case with the least disturbance to the pendulum. 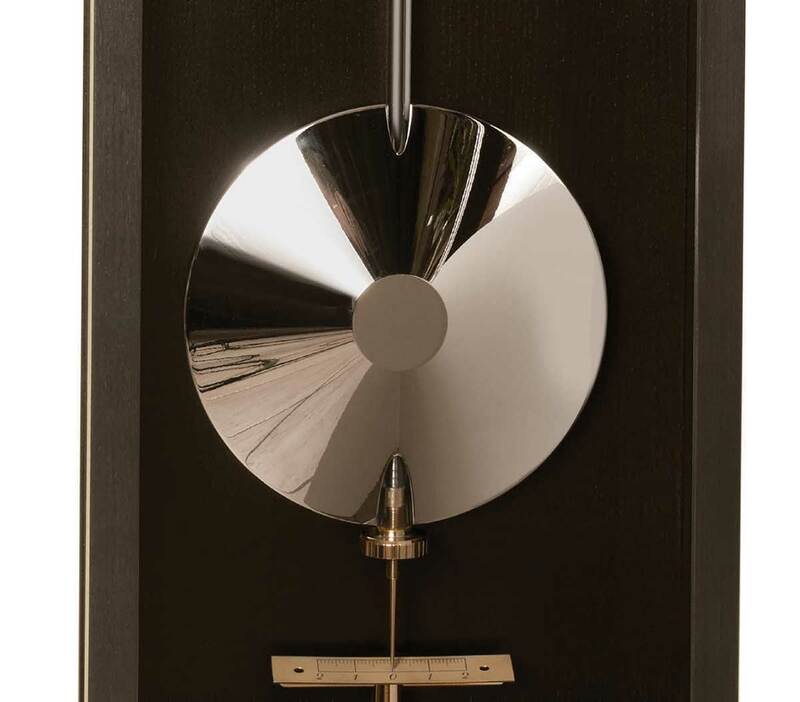 The pendulum bob, weight shell, pulley, line hook, winding crank, and the beat plate stand are rhodium plated. The French Silvered beat plate is curved to the radius of the pointer and set at an angle of 17 degrees for easy reading; the engraving is dark blue filled. The illustrated case (Figure 10) is ebonized ash. 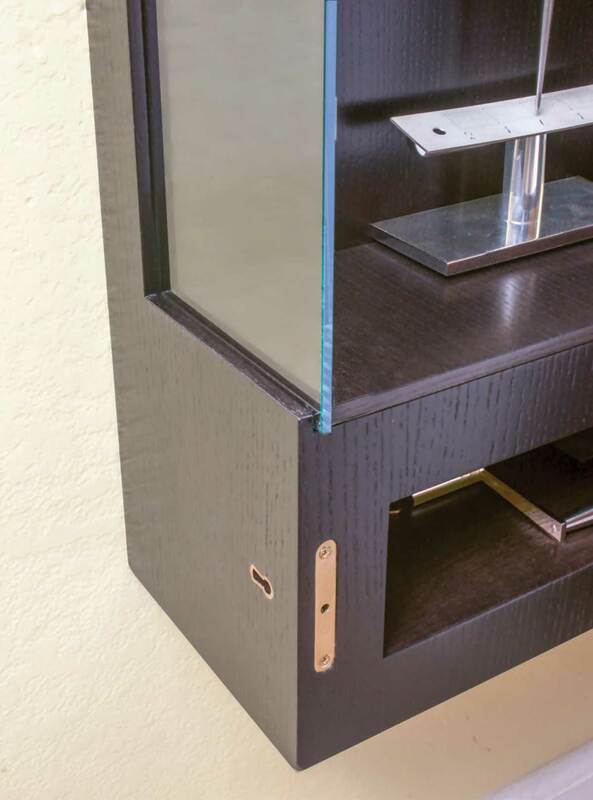 The case is available in a variety of woods and finishes. The Watchmaker’s Regulator is entirely and proudly made in the United States with the exception of 23 of the 25 jewels. Figure 7. The engraved dial. PHOTO BY BILL TAYLOR ASC. Figure 8. Escapement aperture and the dial signature. PHOTO BY BILL TAYLOR ASC. Figure 9. Under dial work and the adjustable counter balance for the minute hand. Photo by David Walter FBHI. Figure 10. The winding crank in the storage cavity hidden behind the door. Photo by Bill Taylor ASC. 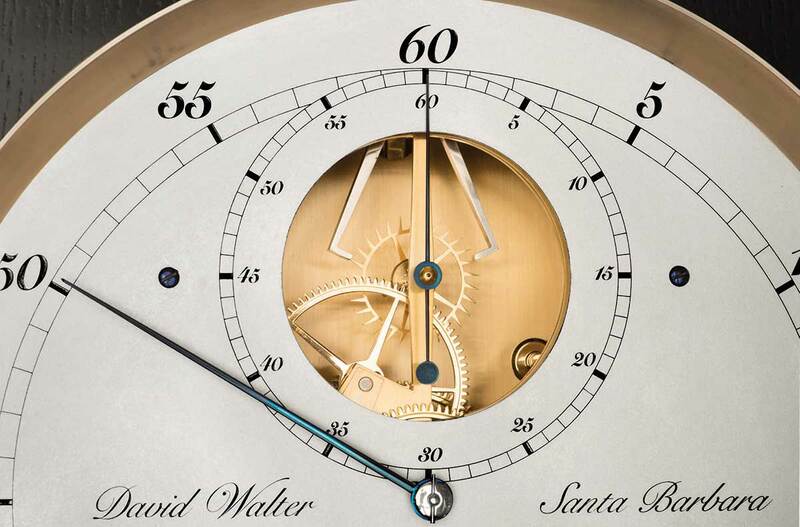 Watch, clock, and chronometer maker David Walter lives in the Santa Ynez Valley, CA, and is one of the few independent horologists in North America, creating original and bespoke watches and clocks using traditional skills and craftsmanship.